This “vacuform” model was built back in the days without the aid of the internet. I think it was offered by Rareplanes, and was a product of the 1970’s. 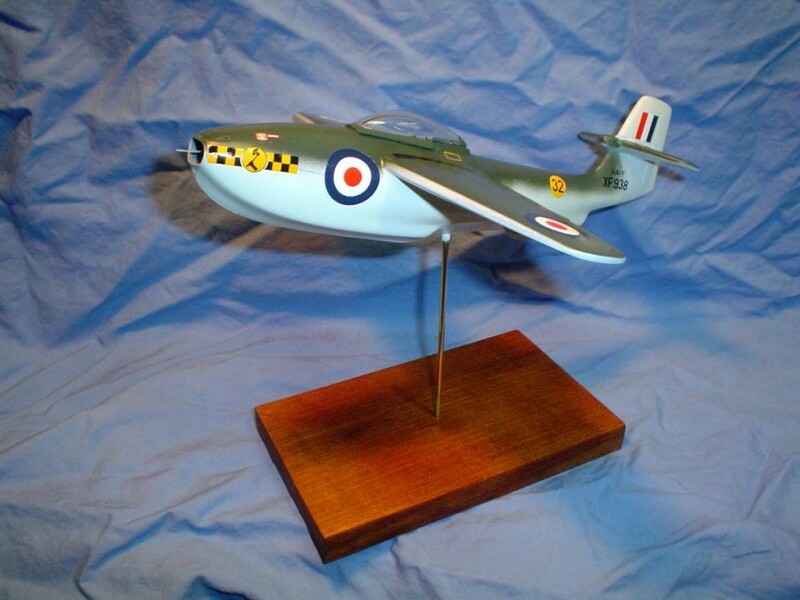 LIke all vacuform planes of the era, it was a simple build in the terms of actual kit supplied parts. And very sparse in the way of prototypical references such as pictures of the actual plane. I concocted the paint scheme and since there were no decals I used what ever I had in the scrap box at the time. 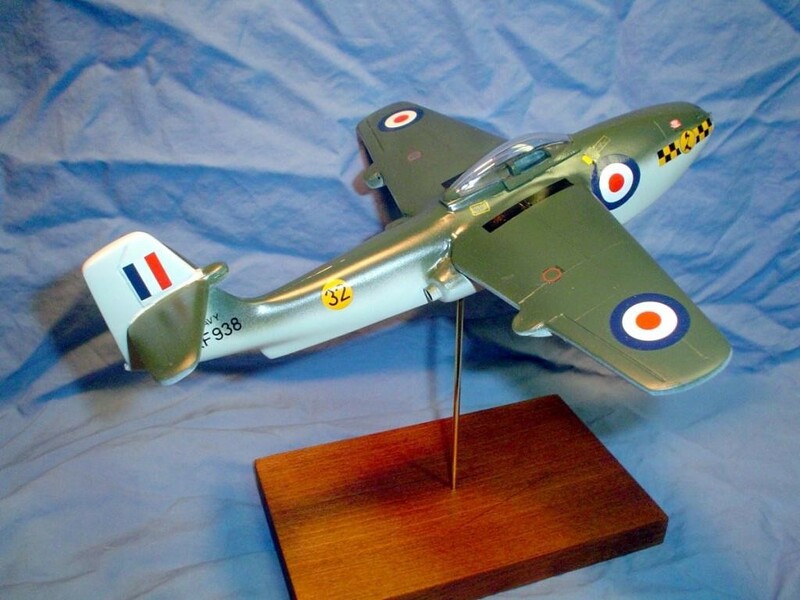 When built (1979), I attempted to keep it “Royal Air Force” in appearence but I don’t recall viewing any photos of this plane on the internet in such a paint scheme(so much for accuracy). As for the real plane it was an attempt to produce a 600 mph fighter aircraft that could operate independent of a fixed airfield. 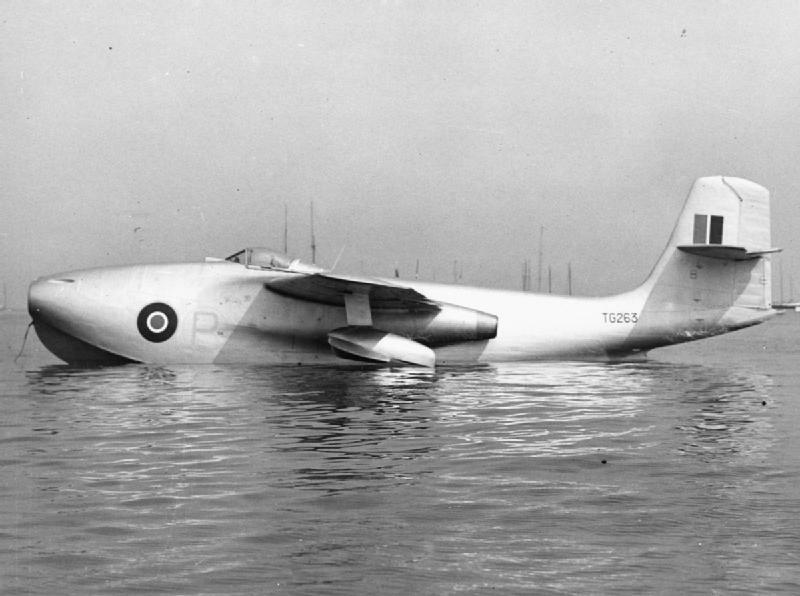 First flown in July 1947, the “Squirt” was 50′ long and had a wing span of 46′. Armed with four 20mm cannon, it’s top speed was 512 mph. Only 3 of these jets were built and one survives today as a museum piece, the other two crashed during tests. A very pretty plane, Mike, and one I’m not familiar with, but as a vac form you’ve done a great job with this. PS you mentioned a museum survivor – any ideas where? The museum is “Solent Skys Aviation Museum” located in Southampton. Perhaps it’s worth a visit if on a holiday trip. Thanks for the kind words. I must admit, I’ve never heard of/seen one, either. But as Rob said, a nice build and a unique example for any display case. Last gasp of the seaplane fighter. The problem with it was all the floating debris that could be encountered whilst taking off or landing. Now there’s a practical consideration you don’t often hear discussed about seaplane take-off/landing. One of the guys at the museum had some enlisted crew time on P5Ms early on in his career. There was an area of the water off the seaplane base used as a runway and landing area. A crash boat would go out and chase all smallcraft off the area, and look for floating debris. Then, the takeoff or landing took place. If a landing, the plane then went up onto the ramp, and thru the wash rack, to avoid saltwater corrosion, etc. Then the crew could secure. More involved than I knew, ’til I got to talking with him. An unusual plane Mike, though well built I will say. Very unusual, Mike, and very nicely finished. Looks like a one man sub..
That’s a good one, it does look like a flying sub! Thanks for the kind words. When it comes to vacforms, this must in many ways be the ideal subject! No props, landing gear or other stuff that usually doesn’t come out very well in this medium! Nicely done, I like the look of it! Thanks Magnus for the kind words. In retrospect, the vacuform kits that contained landing gear, props, etc were so poor that a builder usually “upgraded” the model by looting their injection molded plastic kits for replacement parts. I love unusual subjects, and you definitely picked one! Done nicely as well – thanks for sharing. This thing ranks as one off the cool “might have beens” right up there with the Sea Dart and P6M Seamaster. Sometimes these oddball planes have the neatest details. Take the floats on this for instance. They rotate 90 degrees as they retract so the draggy step is inside the wing and the nice smooth portion is on the outside, like a MiG-15’s slipper tank. I think where this one was ahead of the other two was the position of the inlet. Right at the nose to avoid water ingestion possible from the spray kicked up on takeoff. What scale is the kit? Thanks for the nice comment. The model is 1:72 scale. You’re correct, odd ball aircraft are always worth a second look. They represent a novel approach to a changing technology. Yeah, besides oddball stuff, I also have a soft spot for flying boats! I also like “what if” projects. USS Midway CVB 41 straight deck, before the retrofit.